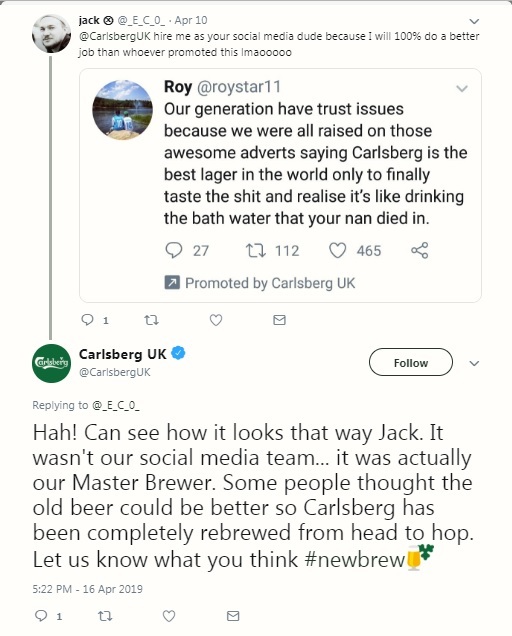 Carlsberg is launching a social video campaign in which its UK staff from various departments read out cruel and colourful things Twitter users have said about its eponymous lager. Created by Fold7, the short films are part of the relaunch campaign for the newly named Carlsberg Danish Pilsner, which received a recipe upgrade and visual redesign last month. They feature staff from the brewery team, quality control, HR, sales and other functions from Carlsberg’s site in Northampton reading out cutting assessments such as "Carlsberg tastes like the rancid piss of Satan", "Carlsberg tastes like a bitter divorce" and "It’s like drinking the bath water your nan died in". 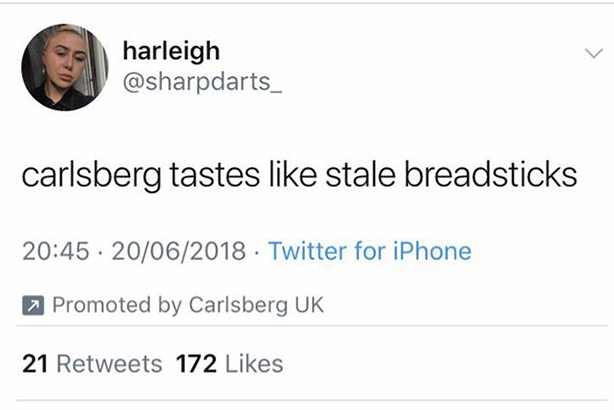 The original tweets started appearing in Twitter users’ timelines last week after Carlsberg paid to promote them, baffling many. The Carlsberg UK Twitter account has now begun engaging with users commenting on the tweets. Speaking to Campaign, Carlsberg’s vice-president marketing, Liam Newton, and director of marketing, Lynsey Woods, said the tweets had elicited a wide range of responses, including from some people who assumed they had been the result of a failure of artificial intelligence. Woods said it had surprised them that anyone thought "you could make a mistake on such a big scale. If we’re honest, we did not expect that." But confusing users had the potential to boost the campaign’s impact by forcing them to engage, Newton said: "There’s so much wallpaper out there. If people are decoding it and thinking about it, that’s got to be a good thing." The relaunch, Newton said, was responding to market conditions that had hurt Carlsberg’s sales in recent years, along with other "standard lagers", including Carling and Foster’s. "People think all these standard lager brands are the same," he said. "They think they taste the same, act the same. It hasn’t moved on, while the world around it has." There are 1.6 million fewer people drinking these beers than five years ago – something that Newton called a "hell of a headwind" to face. But he added that beer drinkers were increasingly looking for higher-quality but lower-alcohol options and that the brand’s history gave it the credibility to reposition itself as one that put the brewing process first. Carlsberg’s founder, JC Jacobsen, was a pioneer in bringing a scientific approach to brewing and in 1883 the brewery isolated the strain of yeast now used in most lager production. "Everything we did was with the mentality of what would he [Jacobsen] do?" Woods said. "Why are we here, what’s our purpose?" This thinking led to the prominent mission statement "pursuit of better beer" on the new packaging. The brand has also launched 330ml cans for the first time and introduced "snap packs", which use adhesive to hold the cans together, cutting plastic use by 50%. Woods also pointed to "the fact that we’re calling out that we are a pilsner – we always have been, but we never really made that clear before". The campaign will continue with a new TV spot starring Mads Mikkelsen, launching on 23 May. The new product will feature at Carlsberg’s festival activations, including Glastonbury and Live Nation events, after the brand focused on Carlsberg Export in recent years. Newton said there was also "a lot of clever geotargeting stuff" planned on mobile.